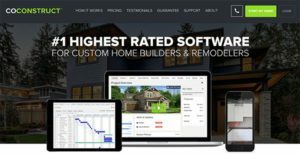 CoConstruct is a web-based custom builder and remodeler software that optimizes the day-to-day operations of builders, modelers and design-build firms. With three well-formulated functionality modules, CoConstruct helps builders and remodelers face common challenges related to their projects, be that budgeting, client communication, scheduling, or activity planning. What makes CoConstruct really specific compared to similar solutions is its unique design that allows management of perpetually changing concepts, instead of limiting constructors’ possibilities to defined types of activities, designs, or materials. The development team made this possible by delivering unrestrained customization; and creating a product open for modifications and client revisions. According to satisfied users, this is CoConstruct’s key secret for streamlining communication with customers. How does CoConstruct enhance business productivity? To start with, this single-entry and estimation system collates all valuable information in a single hub, from where users can control orders, budgets, bids, and even specific selections. You will appreciate the presence of dedicated client portals, and lead and content tracking which helps the company stay in control of all orders, and deliver top notch service to each customer. CoConstruct also integrates a comprehensive financial module used to manage estimates and proposals, handle biddings, and pull off summaries for smarter forecasting. Being completely cloud-hosted, CoConstruct eliminates all hassle related to complex installations and expensive maintenance and offers an intuitive interface that will make it your team’s favorite working tool. You should also consider it because of its reasonable pricing (individual quotes for each customer), and the number of handy integrations that help it blend within any software environment. The true value of CoConstruct is that it keeps the selections process simple, fun, and flexible for both team members and clients. As our experts like to put it, CoConstruct is a win-win construction management tool – while your clients are served in an individualized and knowledgeable fashion, your agents collect information for smarter decisions and accurate financial planning. This way, businesses achieve their main goals: winning projects, streamlining planning and delivery, and projecting costs and prices that suit both their pockets, and the pockets of their clients. How exactly does CoConstruct make this possible? CoConstruct is a flexible system that helps companies make the right selections, and works well for standardized and custom projects. With your team, you’ll be able to efficiently organize your activities as well as other project components such as prices, specifications, and relevant documents and files. CoConstruct makes this possible with custom scheduling, to-do lists, and in-team sharing, all with the main purpose of making bidding simpler and less time-consuming. Managing projects and tasks will be easy using the system’s drag-and-drop mechanism, thanks to which schedules are coordinated both for field and office agents. All tasks and action items will be displayed on a single list, completely open for adjustment, and fully accountable for future reporting processes. The system has even an alternative method of saving time, i.e. single-entry estimations that allow agents to build specs in seconds, and to avoid costly mistakes. All cost items on the selection list will also be open for quick editing, and the updated data will flow seamlessly to your budget and QuickBooks base for smarter-cost estimation. The simpler your trade communication is, the more rewarding your bidding processes will become, and that’s exactly what CoConstruct is trying to achieve. The system helps create bids in minutes, as all specs and estimate data will flow inside them without you having to enter it manually. The system will also keep an eye on updated files and bid details, and make those visible without even a single notifying email. Note that the system offers beautiful pre-made templates you can use to make proposals more engaging. This way, you won’t have to wait on your trades to make a move, but rather stay in control of their activities, and send them automated reminder as the due date approaches. Once all data is gathered and arranged in a single system, your projects will be instantly ready for submission. Thanks to this intelligent system, you will focus only on promising works and projects, and have a bigger chance to win them because of improved quality and time effectiveness. CoConstruct has a dedicated communication modules and an array of advanced functionalities that make communication easier. The rationale is to keep field and office agents coordinated, and to give them an internal network where they can suggest ideas and exchange files. From the clients’ perspective, CoConstruct makes your brand appear credible and more professional, as you’re able to dedicate time for each person with a question or a request. Your agents have all client information displayed on their screens, and are thus able to serve them accurately and in time. At the same time, they will have your info database available 24/7 and on all devices. Still, the best part of having external communication under control is the intelligence it provides. It helps you improve your lead management skills. With CoConstruct as your ‘intermediate and counselor’ you will track all contact details and history and assign tasks in line with it, and be able to score and categorize leads in the desired manner. This will help you make special offers and prioritize hot leads, and consequently take sales to a whole new level. At the same time, you will have the chance to improve your punchlist and warranty process, and boost your reputation among potential clients. CoConstruct gives you the tools to impress subscontractors and improve communication with them, but also to obtain the feedback needed to tackle bottlenecks. Another thing CoConstruct is really good at is budgeting and forecasting project costs, as once you set specs and selections, your budget values and cost codes are automatically generated. Each time an adjustment is made to your selection list, it becomes visible in the budget as well, and you don’t have to change anything manually. Summarized cost information beginning with latest expenditures will always be available to your colleagues and clients. Here comes one more of CoConstruct’s unique functionalities. This system is incredibly simple and easy to use, but nevertheless shads good light on your service and accountability. You can design it in your own way and make it more business specific, and use any of the company’s professional marketing materials (custom videos, PP presentations, etc.) to promote your work. CoConstruct’s functionality is not limited to traditional desktop apps, but open to use by field agents who control work while happening (both from Android and iOS devices). The mobile apps are also designed for clients, in which case you’re invited to make them brand-specific, and include your own logo, image, and contact information. Basically, what clients see is not CoConstruct, but an app that belongs to and was designed for the activities of your company. What Problems Will CoConstruct Solve? The software features scheduling, to-do and task management, managing warranty & punchlist items, drives efficiencies for specs & selections, has the ability to attach files and photos to projects & to-do items, save times coordinating bidding efforts, maintains accurate job logs, keeps the time tracking accurate, and can all be accessible while on-site or on the go with a custom branded mobile app for your company. The software helps builders to track and convert prospects into clients, makes the communication about selections simple and hassle-free, generates client-facing proposals effortlessly, features a client portal for transparency and communication, features award winning communication that tracks all emails and texts in one central place, makes the communication about bidding seamless and efficient, simplifies and speeds change order approvals, allows for photos to be added to selection items and to-dos in order to convey more information than just words, and everything is branded to a builder’s company so they get the credit for everything. The software helps builders control their financials like never before by first seamlessly integrating with their accounting software, removing double-entry between systems & spreadsheets with single-entry estimates, which flow directly into proposals, bidding, budgeting, forecasting, actuals, and is built with industry best-practices templates based on NAHB cost coding. Change orders are a breeze, and tracking payroll with the time tracking feature is painless. Knowing where the financials are at any given point during the project has never been easier. If you are considering CoConstruct it might also be sensible to investigate other subcategories of Best Construction Management Software listed in our base of SaaS software reviews. There are trendy and widely used applications in each software category. But are they necessarily the best fit for your enterprise’s specific needs? A trendy software product may have thousands of customers, but does it present what you need? For this reason, do not blindly spend on popular systems. Read at least a few CoConstruct reviews and think about the elements that you wish to have in the software such as the fees, main tools, available integrations etc. Then, shortlist a few systems that fit your wants. Check out the free trials of these products, read online comments, get explanations from the vendor, and do your investigation meticulously. This profound research is certain to assist you select the most excellent software solution for your organization’s unique wants. How Much Does CoConstruct Cost? We realize that when you make a decision to buy Construction Management Software it’s important not only to see how experts evaluate it in their reviews, but also to find out if the real people and companies that buy it are actually satisfied with the product. That’s why we’ve created our behavior-based Customer Satisfaction Algorithm™ that gathers customer reviews, comments and CoConstruct reviews across a wide range of social media sites. The data is then presented in an easy to digest form showing how many people had positive and negative experience with CoConstruct. With that information at hand you should be equipped to make an informed buying decision that you won’t regret. What are CoConstruct pricing details? What integrations are available for CoConstruct?